The original PlayStation game never made it out of Japan. 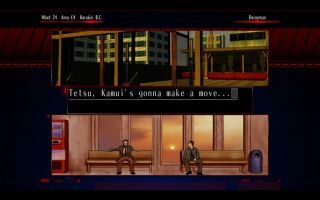 Before KIller 7 and No More Heroes, Suda51 made a text-heavy murder mystery visual novel named The Silver Case, and what with those being all the rage these days (thanks to Danganronpa, 999 and the like), it makes sense for there to be a remaster in the works. Not least because the original never made it Westward. Suda's studio Grasshopper Manufacture is handling it, and it's coming to PC this Autumn/Fall (you'll be able to find it on Steam and Playism). You're expecting the game to be a bit weird, because Suda, but it's a little more serious and perhaps with a darker theme than his other games, at least if we judge it on the debut trailer alone. And I just love that character art, which reminds me a little of Shin Megami Tensei.